Worn only in special parade (the kukri drill) when high rank officers and VIP dignitaries attend to observe the occasion.. The Nepali Army (NA) or “Nepali Sena” is the army of Nepal and a major component of the military of Nepal. The NA includes the Nepalese Army Air Service and the Nepalese Police Force. Service is voluntary and the minimum age for enrollment is 18 years. Its primary role is to defend the territorial integrity, sovereignty and independence of Nepal. Secondary role is to provide assistance to the Civilian Government of Nepal in the maintenance of Internal Security. Other duties include humanitarian assistance/disaster relief operations, assisting in national development, nature conservation efforts and participation in international peacekeeping mission. Prior to 2006 the Nepali Army was known as the “Royal Nepalese Army (RNA)” and was under the command of the King of Nepal. Yet following the “Loktantra Andolan II” (People's Movement for Democracy 2nd) on the 18th of May 2006 a bill was passed by the (unelected) Nepalese parliament curtailing royal power, this included renaming the army.Some of the senior units of Nepal Army follow: The Senior most unit is the Sri Nath Battalion, raised in 1763.The Purano Gorakha Battalion was also raised in 1763 as the First Gurkha Company and, like the Sri Nath, has an impressive record of Service, first against the British and later alongside them. The Kali Bahadur Battalion was raised in 1831, and was the first Nepalese unit to fight ‘Overseas’ in Burma in the second World War. Other units from Nepal include the Sher, the Mahindra Dal, the Shamsher Dal, the First Rifles, the Devi Dutt and the Gorakh Bahadur. Currently the head of the Nepal Army (Chief of Army Staff) is General Rajendra Chhetri. Nepal Army Ceremonial is the second knife issued to Nepalese Army. It is issued to Nepalese Army on enlistment and is retained throughout the army career. It is a part of a soldier’s armor and well looked after until they retire and a prize possession after retirement. Nepal Army Ceremonial is worn only in special (occasional) parade (the khukuri drill) when high rank officers and VIP dignitaries attend to observe the occasion. Senior officers also regularly inspect this khukuri in order to maintain the smartness and tidiness of each soldier. The scabbard is made of best quality patent leather to give extra shine and smartness to the uniform. During the presentation they withdraw the khukuri from scabbard and hold it out for the guest to inspect. 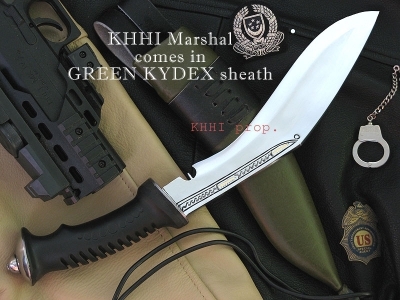 The blade is also skillfully crafted and recruitment date of each soldier is engraved. A soldier retains this khukuri throughout their army career and is a prize possession after retirement. Twin belt stripes are fitted at the back portion of the scabbard. 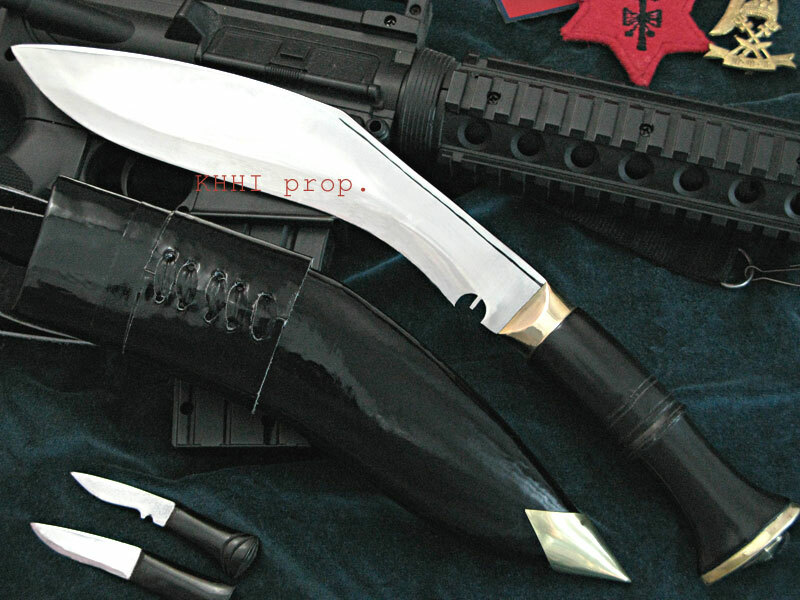 Nepal Army Ceremonial khukuri is slightly smaller than the standard size as this makes it easier to carry around and can be handled more swiftly. It is the simplest of all khukuris. Truly an authentic military icon from Nepal to exhibit proudly. Size of Blade: 9 inches approx.